For more information on this print, please see Marja-Leena’s blog post about it, and visit her gallery to see the rest of the series. 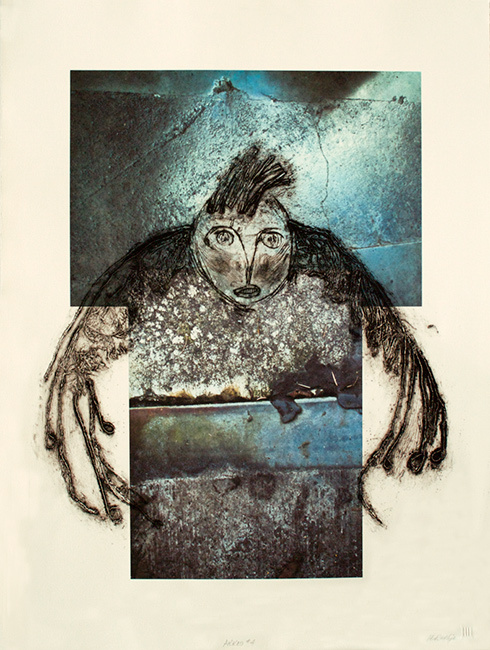 Marja-Leena Rathje is a Finnish-Canadian artist specializing in printmaking and photography. She is crazy about weathered rocks, prehistoric art and the archaeology of past, present and future. She lives and works near the sea and the mountains of Vancouver and has exhibited widely, both internationally and in her local region. Karyn, thank you! I grew up in Winnipeg so I know exactly what you mean about cold and dressing for it! Though I wasn’t thinking of cold when doing this piece but it’s very interesting hearing the wide variety of responses from viewers. I’d like to especially thank Beth and Dave for the wonderful commentary you’ve done here! Also, the contrast between the fuzzy/feathery wings and the iridescent bricks is eye-capturing.